November 1984. George Orwell’s dark vision had not fully emerged, but the veneer had worn off of the fairy-tale world promoted by the evangelical, free-market professors at Grove City College. As a blue-collar kid in a blue-blood institution, I was out of place. The campus was buzzing, however, about a new movie—A Nightmare on Elm Street—for which I finally plucked up the courage to ask a cute coed for a date. I’d never seen a slasher movie before, having sampled mostly traditional monster-flick fare as a child. I felt a sense of accomplishment since some of my college friends had to leave the theater for fear. On the big screen, with no previous knowledge of the plot, the film worked for me on many levels. Last night I decided to watch it again. My first reaction was a sense of surprise at how much of the movie I still recalled with pristine clarity. For having been nearly thirty years ago, such clarity is a rare phenomenon for many details of life, often reserved for memories of early girlfriends. A second reaction was noticing how religion featured in the film. The girls skipping rope chant, “One, two, Freddy’s coming for you / Three, four, better lock your door / Five, six, grab your crucifix.” Indeed, the crucifix features in several scenes as an ineffectual weapon against Freddie Krueger. The days of defying vampires are over when your own subconscious turns on you. In one of the early chase sequences, Freddie, raising his infamous glove, says, “This is God!” Religion and its overarching concerns with death and suffering come together with horror in that one moment. The traditional power structures of religion have lost their power to defend the troubled teenagers. The only one well adjusted is, ironically, Johnny Depp’s Glen. Even he falls victim to the revenge sought by Krueger. Surprisingly, the scene I had most trouble recalling was the end. 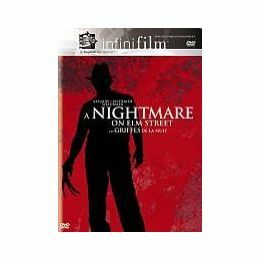 I recollected the bright, hazy sunshine, but couldn’t remember how Wes Craven released his audience from the drama. Of course, there is no end. Freddie came back in countless sequels, none of which I ever watched. Although I wouldn’t know it at the time, Robert Englund based the screen presence of Freddie on Klaus Kinski’s Nosferatu in Werner Herzog’s classic remake of that silent gem. Freddie is the vampire that defies religious cures. Movie villains are among the most adept practitioners of resurrection on the silver screen. The occasional E.T., Neo, or Spock will come back from the dead, but those who repeatedly return are the denizens of our nightmares. As Orwell’s vision continues to unfold in subtle ways, 1984 looks like an age of innocence before the ineffectual god worshipped by the establishment became self-image, writ large, on Elm Street. One of the entrenched ironies of human mentality is that reason will not suffice to change religious views. 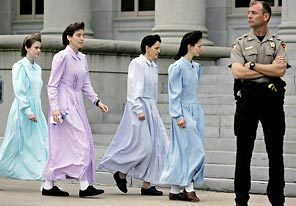 Many studies have repeated demonstrated that faith is impervious to logic, and this has appeared with Ektachrome clarity in the case of Warren Jeffs. Rev. Jeffs, the leader of the Fundamentalist Church of Jesus Christ of Latter-Day Saints, has painted himself into a mental corner that makes the logic of legal proceedings appear as slapping the idiot. Logic and faith do not connect. Any Christian who has read the letter to the Hebrews should know that. Nevertheless, Rev. Jeffs, having illogically dismissed his team of lawyers, has been attempting a divine defense to justify his alleged sexual abuse of minors. He remained silent during his opening statement, despite judicial advice that such a tactic might harm his case. Breaking silence yesterday with a nearly hour-long sermon, faith responded to logic and was found wanting. Society at large fails to consider that studies of religion have been carried out from multiple angles over many decades. We have erudite studies of the philosophy of religion, the psychology of religion, the anthropology of religion, and the sociology of religion. They all point to the human origins of this phenomenon, often demonstrating that a basic disconnect remains when religious belief is brought into the harsh light of logic. Neurologists and biologists have explored the utility of religion as a survival tactic, and evolution seems to have blessed it. Yet trial lawyers, judges, law enforcement officials, and politicians—often themselves religious individuals—are charged with apprehending and convicting others who simply take their religion to extremes. Religions make untenable demands on adherents. God has a poor record of turning up in the courtroom. His divine statements are absent from the stenographer’s tape. Not knowing the details, it is difficult to find much sympathy for Rev. Jeffs, should he be found guilty. Yet at the same time, his interpretation of religion differs only in a matter of degree from other religious sexual ordinances. Is it normal for a clergyman to live a lifetime of enforced celibacy? Although signing on the dotted line may indicate a tacit agreement with church policy, what young man can clearly anticipate the pressures of decades fighting biology and psychology? Yet the practice is perfectly legal. Until the nearly inevitable inappropriate results squirm out. Public rancor runs high, as it should, against child molesters. The children are innocent victims. The perpetrators, however, believe themselves to be following divine dictates. It would seem that much suffering would be ended if God would go on the record here, so that we might have solid evidence with which to judge the case. If it please the court. Positions of power replicate themselves. In a sense this is understandable as power is the most addictive substance on the planet. Once superiority is asserted, it will never allow itself to be uprooted. With the recognition of homosexual marriage in New York, many heated reactions sprouted from the position of power man-plus-woman (always in that order) camp. Such a response was predictable and anticipated. I suspect it is largely based on fear. I have many friends with differing sexual orientations than mine. Raised to castigate such individuals, that outlook became increasingly difficult to uphold once I got to know my gay friends as people. I count them among my most loyal friends. People are people. The problem lies in labels. Humans are natural categorizers: bird, fish, or mammal? Predator or prey? Religious or secular? We want our world to stay true to categories we devise. People, however, are seldom easily classified. Still, we try: skin color, ethnic ancestry, religious heritage, sexual orientation. People are people. The world of trite classification is ending, and those in positions of power tremble. Anything that is different might upset the economic balance that keeps those on top in their positions. (My own amateur observation, however, is that the economic balance is naturally top-heavy and readily upsets itself. It seems to have been that way since before this blog began.) Would we not do better to try to understand those who are different than ourselves? As an exercise in this direction, I recently read Alvin Orloff’s smart satire, I Married an Earthling. As my long-term readers know, I have a slight soft-spot for aliens, and this story of a gay man finding nothing but rejection on earth and eventually marrying an alien seemed quite fitting in the present climate. 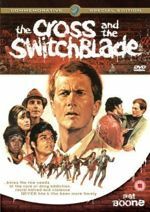 Not part of the gay subculture, many aspects of the story were foreign to me, but what was painfully clear throughout is that people are people. Some are accepting, others are not. When reality offers so few options that he must flee his own planet, Chester, one of the protagonists, takes to the stars. At a couple points before his exodus, he notes the role that religion played in his antagonists’ outlooks. 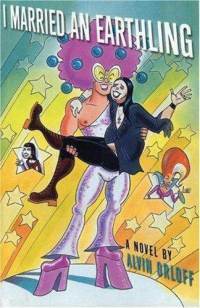 The book is lighthearted and funny overall, but the serious issue remains. Those in power tend to horde privilege. When that happens, economies—material and spiritual—collapse. Not having access to the news wires, I am generally scooped by CNN’s Belief Blog. Of course, blogs dealing with religion are a pretty cheap commodity these days, especially since, as I’ve mentioned before, everyone’s a self-proclaimed expert on the subject. So it appears appropriate that God’s approval rating was put to the polls. According to Public Policy Polling, God only enjoys a 52 percent approval rating. Only 9 percent of those surveyed dared give God a negative “disapprove,” but that still leaves a large middle ground where— to borrow a phrase—God is in the dock. The scenario where a democratic society expresses its opinion on leadership, both human and divine, makes me recall the movie The Mission. Fr. Gabriel has to remind Fielding at one point, “We [the church] are not a democracy.” Religion is handed down from on high and those who inherit it have no right to question. Or do they? When I was growing up in the sixties one of the common social references in the media was the teenager (oh, what rebellion!) yelling at his parents, “I didn’t ask to be born!” In the current universe, however, that is where all religious believers find themselves. With the exception of the few who suppose themselves somehow self-generated, we all realize that we are subject to the whims of the creator. That, of course, does not prevent us from sharing our opinion on the issue. Fr. Gabriel is right: this is not a democracy. The stereotypical 1960s teenager is also right: we did not ask for this. No wonder the approval ratings for the divine have plummeted. It seems that the tenets so readily accepted in more submissive times have eroded. Is God about to retire? Step quietly from center stage? What’s next for the Big Guy? Will he write his memoirs—wait, he’s already done that; what do you think the Bible is? Perhaps an unemployed creator would be interested in making another universe. 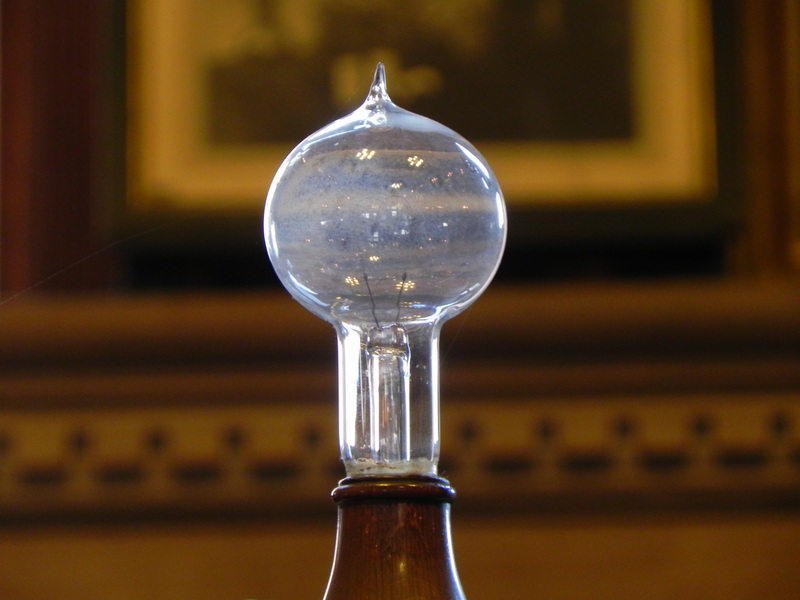 The problem is that wherever consciousness exists, ideas will soon follow. Some ideas fit comfortably in the system: do as you’re told because I’m stronger than you, for example. When the expression of power as an inappropriate means of governance evolves, however, the voices of democracy will emerge. Maybe it is safer to schedule an apocalypse after all. Let’s just hope that God doesn’t take a page from the politicians’ handbook, otherwise nothing will ever really change. Occasionally the symbol of the Prince of Peace is used as a weapon. A current case playing out in New Jersey revolves around a Livingston man and his convictions. Originally erected for Lent, the homeowner in question placed a wooden cross within a municipal right-of-way zone where signs and potential distractions to drivers are prohibited. When informed of the violation the owner removed the original cross and placed a larger one just within the right-of-way zone. When asked to remove it he contacted the Alliance Defense Fund—a group of Christian lawyers (which sounds apocryphal to me) who advocate the spread of the Gospel. This bizarre case is now being cited as a test of a land-use law that protects religious expression. A few inches would have resolved this entire mess. Had the homeowner placed his second cross beyond the restricted zone, no fuss would have been made. I don’t really feel safe in a world where bands of renegade Christian lawyers rove about seeking to support the violation of public safety ordinances. Instead of friendly persuasion the cross is here used as a cudgel. Perhaps wearing one’s religion on one’s sleeve ought to be accompanied with a measuring tape. Certainly there are those impressed by the masculine chest-thrusting implied in defying laws to assert one’s particular take on religion. Pushing such issues to the point of public funds being spent to enforce a law throws the action into sharp relief. Some varieties of Christianity (and other religions too, I’m sure) thrive on the fiction of persecution. Is the quality of life of the homeowner affected deleteriously by not being allowed to place a cross in a no-sign zone? Is it not rather an attempt to set, in H. Richard Niebuhr’s phrasing, Christ against culture? What friends (besides lawyers) does it win to the cause? Having gone through a phase myself where PDR (Public Display of Religion) was considered the only way to be authentic about belief, I think I might understand the original intent of the homeowner. A clergyman, however, long ago set me straight with a frank discussion of subtlety. What I came to realize is that shoving only leads to shoving back. Perhaps moving the cross six inches would be the equivalent of turning the other cheek? But when the other cheek is turned, lawyers don’t get paid. John Lennon has great currency, in part, because he is a martyr. Music has moved on since the ‘60s and ‘70s, but aging Boomers still like to quote him, especially his song “Imagine.” In an article written for the Los Angeles Times, reprinted in the local Sunday newspaper, J. Anderson Thomson and Clare Aukofer cite “Imagine” as the statement of what a world “that makes sense” looks like. I applaud their idealism. Citing psychological and sociological work that has been done over the past decade in the attempt to unravel “homo religiosus” they entitle their article “God didn’t make man: man made gods.” Much of the evidence they cite has been discussed elsewhere on this blog, but the overarching issue—whether this explains human religious behavior or not—remains open. In other words, if evolution provided us with religion, it must have some survival benefit and humans are not easily going to dismiss it. Admittedly, the evidence for human conceptions of God arising from the need for close connections in community is pretty convincing. Nevertheless, the issue of whether there is a God or not will never be answered by empirical observation. As I tell my students, belief is not based on empirical observation. We do not yet know why people believe, and even if we find the right node, neuron cluster, or sensory stimuli, there will always be those who insist that the hardware is sparked into action by the unseen Other outside the system. It is the classic chicken or egg debate, taking place in that henhouse in the sky. The problem is that God is more like the rooster in that scenario. The human brain is an endless source of fascination. Science has given us a sense of wonder about our own on-board computer, but it has not managed to capture the sine qua non of the totality of the experience of owning one. Scientists also read, go to shows, make love and eat fine meals for the enjoyment of it all. But as Cipher says in The Matrix, “I know this steak doesn’t exist. I know that when I put it in my mouth, the matrix is telling my brain that it is juicy and delicious. After nine years, you know what I realize? Ignorance is bliss.” Our perception of the world as a stable, unmoving center of existence is an illusion. Science has revealed an even stranger reality involving equations that used to haunt my nightmares. Should God ultimately be reduced to formulae, true believers will find another entity to name as the divine. “Imagine… no religion too”? As long as humans are humans such a world remains pure imagination. Things represented on the Internet are not always what they seem. Removed to the back-bench of academia, I don’t have the opportunity for research that I once had. Every now and again, however, I still like to see what people are saying about Asherah. When I check the popular goddess books available off the shelf, my book on the subject is not often mentioned. At least on the Internet some researchers seem to have noticed it. A recent search for Asherah on Google, however, brought some surprising results. 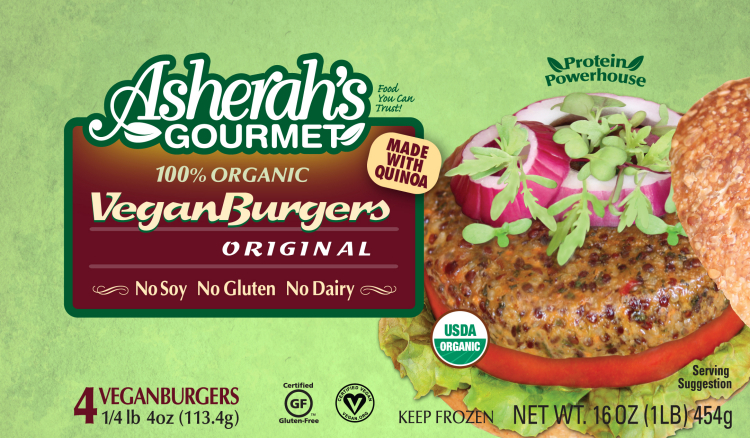 The first item of interest was a quinoa-based, organic veggie burger from Asherah’s Gourmet. The Asherah in question here, however, is simply a woman’s name. As a vegetarian I thought I would put a word in for the product, in any case. I found this brand at a health food store last week, but miles from home and with an air temperature of over 100 degrees, I was afraid the frozen products wouldn’t make it home without half baking in the car. My next stop on the web was Sacred Suds. 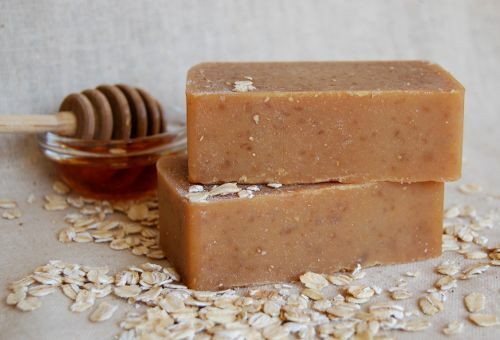 This New Age-themed site offers hand-made soaps, many of them associated with goddesses. The product entitled Asherah is named for “the Canaanite mother goddess” and is made with milk and honey. The website doesn’t actually state anything about washing away sins, but it seems difficult to go wrong by washing with a goddess. Another selling point—also not on the website—might be to point out that Asherah is known as the one who “walks upon the sea.” There is even a scene in the Baal Cycle from Ugarit where she is presented as doing her laundry in the sea. Asherah and soap, it seems, are a natural match. One final product seems to be biding its time, although I suspect there is a market for it. 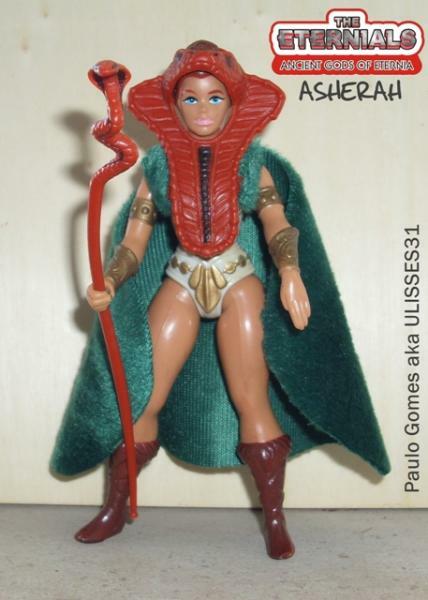 The Asherah action-figure, privately made, does not appear to be commercially available yet. Garbed in an Egyptianizing cobra headdress, armed with a cobra staff, this heroine looks to be a suitable partner for Captain America, bringing the United States and Middle East together in an attempt to bring peace to a troubled region. Maybe heroes can accomplish what gods apparently can’t. Not exactly big business yet, nevertheless Asherah appears to be on the move. Maybe once she breaks into the big time, those of us who’ve tried to make a living on her cape-tails might be dragged out of obscurity as well. In the meantime, it is about time for a veggie burger and a luxuriant bath.